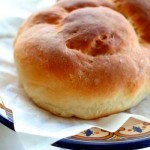 Sfenj are marvelous in the way that only freshly baked yeast pastries know how. This modest dessert had top American chefs waxing poetic over the wonders of traditional foods, and understandably so. 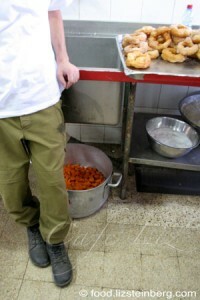 Back story: Four well-known American chefs were at an army base in the Golan, whipping up dinner for a few hundred soldiers. Four well-known chefs and one Ruhama Ben-David, mother of 10, grandmother of 32 and great-grandmother of several. Eight of those children had already been born when she immigrated from Morocco at age 22 in 1963. In fact, that was one of the first things she told me, I imagine because she realizes how much things have changed. Maybe because she thinks about it often. Nowadays, she’s an event caterer, and there she was on base, making industrial quantities of sfenj. When family gatherings can mean hundreds of people, cooking for an army isn’t much different, she noted. While not exclusively a Hanukkah food, there’s no better time to think about them than now — they certainly fit the spirit of the holiday, which is about eating copious amounts of fried food (OK, aside from religious and historical aspects). All that oil can be hard to digest, but I believe that the better the food, the more willing my stomach is to make the effort. 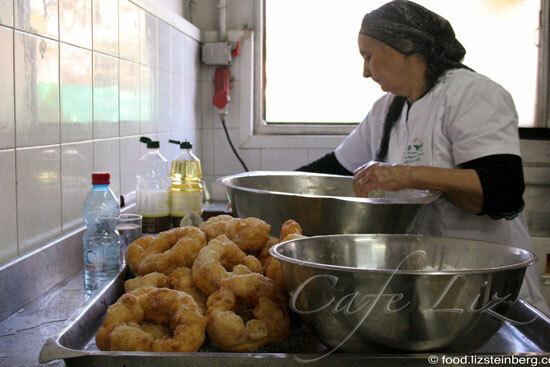 Like many traditional foods, there are several schools as to how to make proper sfenj (you should see the heated debates going on in the comments sections of some recipe sites in Hebrew). One says use no sugar whatsoever in the dough, something I’ve seen on English-language Moroccan sites; other recipes, particularly those in Hebrew, include sugar. 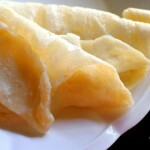 Some use a standard, soft dough; others use so much water in their dough that it’s more like a batter. Some use eggs. 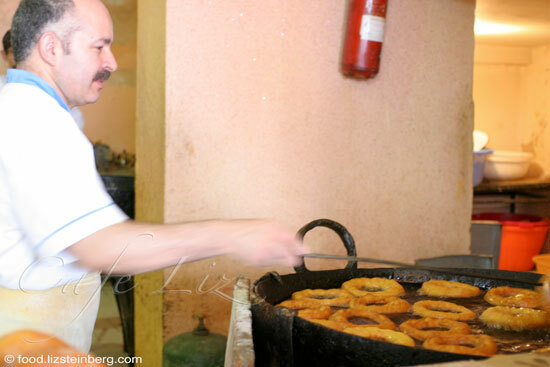 Some, including Ruhama, divide the batter into balls for the second rise; others tear and fry lumps of dough straight from the bowl. 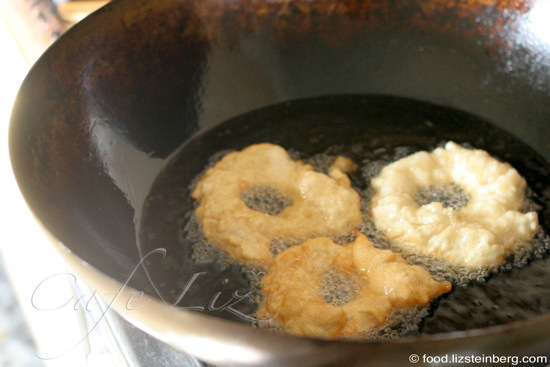 Some say the dough needs at least 4 hours to rise; Ruhama went from mixing the dough to frying the donuts within an hour (it was peak summer). That said, I got the best results with longer rising times; dough that rose for only one hour came out tasting like fried bread. 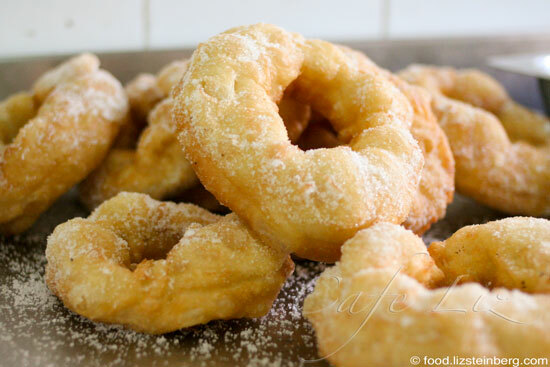 The name sfenj is based on the Arabic word for sponge, but that doesn’t mean these donuts should absorb much oil, so long as you fry them at the right temperature. A thermometer is great for this (if you don’t have one, here’s one just like mine for $5.63, global shipping included). I start frying once my oil hits 200 degrees Celsius (390 F), and try to keep the oil within a 200-220 degree Celsius window (390-430 F). At this temperature, lots of bubbles should immediately start streaming off of any batter dropped into the oil. Don’t let the oil heat up too much past this point, though, or the donuts will turn dark brown very quickly, or worse, burn altogether. My donuts had only a light amount of oil on the outside, and no oil whatsoever inside. Other notes on frying: My pan of choice is a wok (photo below) — large, easy to clean, and any oil stains merely add to the seasoning. I use wooden chopsticks to maneuver the donuts in the hot oil. To form the donuts, wet your hands to keep the dough from sticking to them as you form it into donut shapes — I’m very cautious about water around boiling oil, but I didn’t find that this created any splatters. Just don’t get your hands so wet that they drip, and you shouldn’t have a problem. If you prefer, you could use oil instead of water. Prep time: 4 hours. Cook time: 10 minutes. Mix together the flour, the water, the 1/4 cup sugar (if using), the yeast and the salt. It should make a shaggy dough that’s too soft to knead. At this time of year, I warm the batter in the microwave for 30 seconds (before adding the yeast) to give it a head-start on rising. Set in a warm place to rise, ideally for four hours. At this time of year, I turn on the oven for a few minutes, turn it off and then put the dough inside. Otherwise, you’ll be waiting until spring for the dough to rise. If you’d like, after an hour you can mix the dough with a fork (in place of kneading) and then split it into egg-sized balls, coat them in oil and arrange them on a plate to rise for the remaining three hours. Alternately, you could just leave the dough in a bowl. Ultimately, it needs to triple or quadruple in size at the least. After the dough has risen, heat enough oil to deep fry in your pot of choice (I need about half a liter to get a decent depth). Once the oil is 200 degrees Celsius (390 Fahrenheit), wet your hands slightly with water or oil and take an egg-sized ball of dough — either prepared on the plate, or rip it straight out of the lump in the bowl — form it gently into a disk and poke your thumbs through the center. The hole should stretch wide enough for your wrist to pass through as you lay the dough into the oil (it’ll shrink as it fries). Don’t handle the dough too much, since you want to preserve the air in it. Monitor the oil temperature to make sure it stays between 200 and 220 degrees Celsius (390 and 430 Fahrenheit). Once the donuts are golden on one side, flip them. Once golden on both sides, remove to a paper towel to blot up the extra oil. Repeat with all the dough, in batches if necessary. 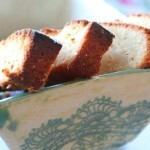 Before serving, sprinkle with granulated sugar. 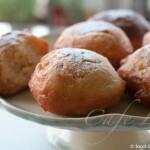 20 Responses to "Sfenj, Moroccan donuts"
Great post! We are up to our ears in fried levivot and sufganiyot at the cafe. I love this holiday! looks marvelous. can you freeze them? Martha, do you mean the dough or the finished donuts? I imagine you could freeze the donuts, but I don’t know how good they would taste afterward. Happy Hannukah! The sfenj look great but where do they put the jam? Haha, if the donuts are good enough you don’t need jam! Could I freeze the dough and leave it rise a few hours from frozen and then fry it up? Fun to make and enjoyed by all at our Shabbos Hanukkah dinner. One question, was I supposed to stir the dough after one hour even if I did not tear off pieces at that time to form individual pieces? I did but wasn’t sure. Thanks, Ben! I think the answer to your question is that it doesn’t matter all that much — I got fine results either way. I really enjoyed reading your post. 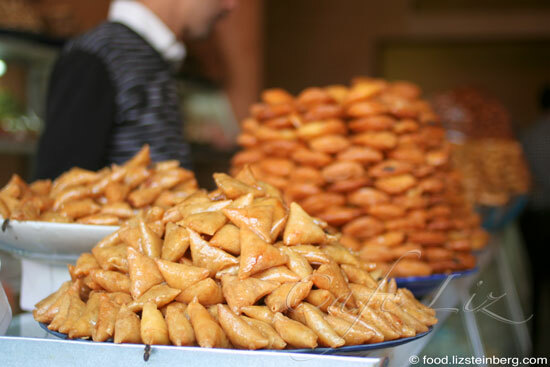 I love sfenj and I use to eat it for breakfast every sundy, backhome in Morocco. For sure I will try your recipe and I hope I will get it right. Thanks for sharing. Thanks for stopping by! I hope these sfenj measure up to what you had in Morocco.